A loyal reader of my blog has requested Parotta recipe many weeks ago and I never got down to making it until this week. The soft and flaky Parotta, also known as Barotta or Porotta, is popular in the Southern states of Kerala, Tamil Nadu and Karnataka. It is a common sight to find crowds thronging the road side stalls where heaps of layered parottas hot off the stove are served with a curry both for breakfast and evening tiffin or dinner. This popular street food fare is usually served with salna or kurma. The side dish with parottas include both vegetarian and non vegetarian style gravy dishes. There are numerous avatars of Parotta where the shape and accompaniments vary from region to region. 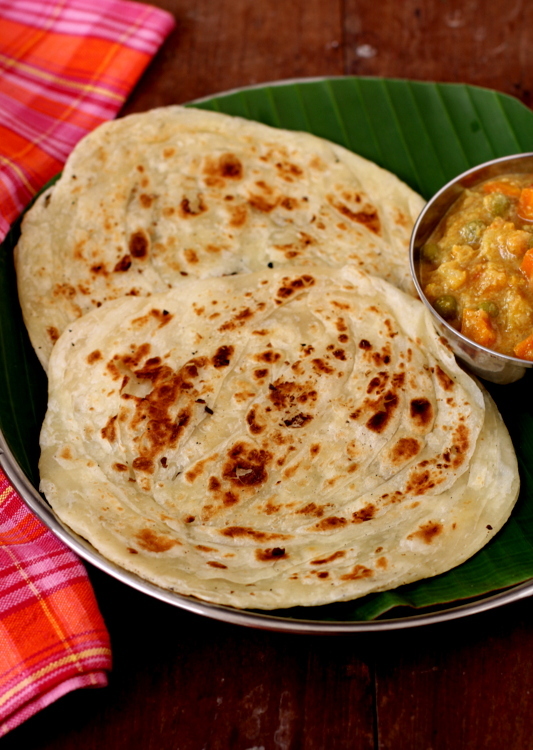 Kerala or Malabar Parotta is usually served with vegetable, chicken, egg, beef and mutton curries while in Tamil Nadu, it is served with either vegetable salna or chicken salna. Usually I do not make Parotta at home and it is only during our travels that I get to relish Parotta, Kothu Parotta and the likes. I used to watch how the ‘parotta master’ would churn out hundreds of parottas with such ease. The parotta making process involves the mixing of the dough, slathering the dough with a generous amount of oil, resting it, pinching off tennis sized balls from the dough where each of these balls is flattened and deftly tossed in the air to create a super thin translucent layer that is pleated into a long thick strip which is then coiled into a circle like a rosette. The rosettes are drizzled with more oil and rolled out into slightly thick concentric rotis and fried on a hot tawa till golden brown. Once the parotta is fried, the parotta master would place a couple of parottas on a flat surface and use both his hands to crush them together (clapping action) to open up the layers of the parotta. These layered parottas are served with hot salna or kuruma. 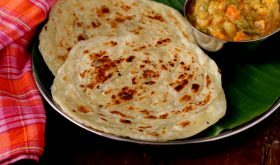 I am posting an eggless Parotta recipe where maida, salt, oil and water are the only ingredients that go into the making of the parotta dough. Those of you who want to learn how to make Parotta at home but are intimidated by the process of making them, let me tell you that it takes one or two attempts to make a fairly good parotta. It takes some patience and practise to achieve a perfect parotta. Keep in mind, the key is to shape the oily dough as thin as possible and its alright to have a couple of tears hear and there. 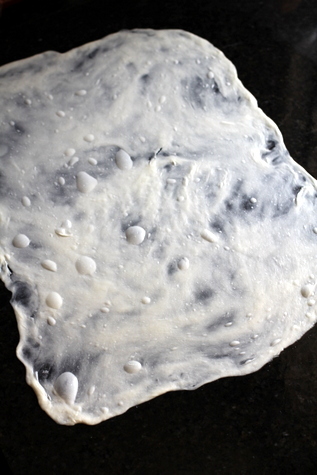 Always keep the dough/balls well greased and covered with a damp cloth so that they do not dry out. I adapted this Parotta recipe which also has a great photo tutorial on how to make Parotta. In a bowl, add maida, salt and sugar and mix well. Slowly add water and make a soft dough. Add a tbsp of oil and mix into the dough. Cover the dough with a lid and allow to rest for at least 2 to 3 hours. Grease your work surface and your hands with oil and pinch dough to make smooth round tennis sized balls. Place the balls on the greased work surface and grease the balls with oil. Take each ball and roll it like a thick roti (approx 4"-5") in diameter using a rolling pin and place the rolled out rotis on the greased work surface. Place them each next to each other. Grease the thick rotis well. Allow to rest for 10 mts. Take a rolled out thick roti and spread it out thin using a rolling pin or using your palms and fingers to stretch out into a thin sheet. The key is to spread it out super thin and as large as you can. Keep smearing oil as your spread the sheet. The shape is really not important. Even if there are a couple of tears, it is completely fine. Now using the fingers, slowly lift up one end of the sheet and make pleats moving towards the other end. Once its pleated hold one end of the long strip and roll it towards the other end to create a rosette and tuck the end under the rosette. Prepare with the rest of other thick rotis and keep the rosettes greased at all times. Allow to rest for 10 mts. 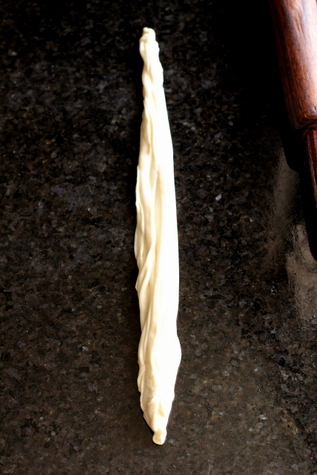 On the greased work surface, place each rosette and roll into a thick parotta, smearing oil as your roll out. Ensure the parottas are well greased. Heat a tawa on high flame. Once the tawa heats up, place the thick parotta on the tawa and cook on both sides till golden brown on medium high flame. Drizzle oil as your roast them on the hot tawa. 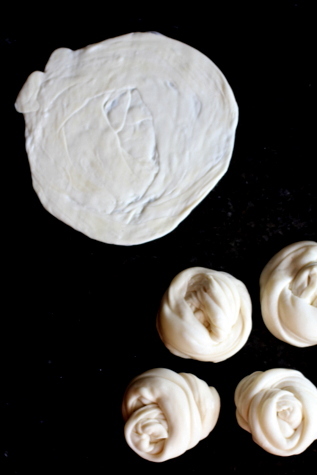 Prepare parottas with rest of the rosettes in a similar fashion. Now take each parotta, place on the work surface and using both your hands, crush them together similar to clapping action. This helps to open up the layers of the parotta. Repeat this action with all the roasted parottas. Serve parotta with vegetable salna or chicken salna. At every stage, the shaped out dough - tennis sized balls/rolled out thick rotis/thin sheets/rosettes/rolled out parottas should be well greased at all times. Allow to rest for at least 10 mts at each stage of the parotta making process. Crushing the hot off the stove roasted parotta is essential step that is not to be missed. By Sailu Published: December 16, 2013 Learn how to make Parotta recipe, a street food of Tamil Nadu. 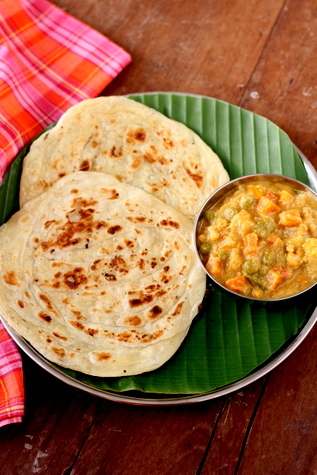 A gem among South Indian breakfast recipes, its served with salna & parotta dough has no egg. Looks awesome!! I hope you plan to share the recipe for the kurma too!! Yes, you can look forward to the vegetable salna recipe too. Have to give you the credit for excellent pictures. Even in Sri Lanka Parota is very popular. I am a little health conscious and avoid such food. Is it possible to make with Atta flour and sun flower oil. Sure you can make with whole wheat flour but it will not be as soft as the one made with maida. So this is what happens when I google my last name.